Newest Release of Member Favorite! We always ask for all of it, and the French always (politely) refuse. But vintage after vintage, we sell out quicker and quicker. So this newest vintage, which likely, again will be one of our most popular and fastest sell out direct imports, came over in as many crates the boat could bring over! That said, we still think there won't be enough to satisfy everyone. New vintage, fresh designation, but the stunning, easy to drink, fruit driven character that we all know and love hasn’t changed a bit, and at only a fraction of the cost for Fontana’s neighbors, the bottle has all the notoriety of the clay and limestone soils as well as the legacy of the terroir for which Bordeaux is regarded, globally, as the best wine producing region in the world. Fontana’s old-vine Merlot (36 years old!) are thriving where others are struggling and exquisitely expressing their character, which a few splashes of Cabernet Sauvignon and Cabernet Franc flesh out into a champion bottle with violet aromas and a rich palate ripe red and blueberries, spice, and earth. Just as much an everyday drinker as it is a celebratory one or one to lay down, the 2016 Chateau Fontana as it is now is the very definition of an easy drinker of which, vintage after vintage, we’ve been repeatedly stunned on how superbly it exemplifies its terroir. This is a solid yet easy to drink wine with ripe fruit flavors and remarkable tanins. 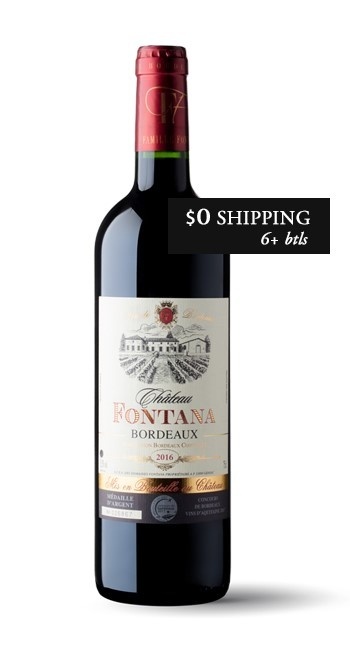 The vineyards of Château Fontana are approximately 35 years old with limestone-clay rich soil. They yield amazing quality Merlot, Cabernet Sauvignon and Cabernet Franc. The wines are dilligently aged to ensure round, supple tannins. Pair this with any red meat. The solid structure of this wine will make for an excellent pairing with a flank steak or a beef brisket. These days, Bordeaux has many faces. No longer is it just the 1855 classification Grand Crus that dominate the market. We are priveleged to live in a modern world where affordable, delicious and layered Old World wines are readily available to us. Here, the Chateau Fontana is a prime example. It's young, it's hip, and it's ready to drink. Welcome to the new Old World.